A couple of weeks ago I posted a recipe for Gianduja ice cream chocolate chip cookie sandwiches. It was the first recipe I’ve made with my brand new ice cream maker (another slight obsession), and got me seriously excited about hazelnuts as an ingredient for the first time. Although I’ve been a lifelong fan of Nutella, I hadn’t really considered the flavours of a simple roasted hazelnut outside the context of this chocolatey, sugary spread. The gianduja ice cream recipe began by infusing a mixture of milk and cream with finely chopped, roasted hazelnuts. In her indispensable compendium, The Flavour Thesaurus, Niki Segnit explains how the key flavour compound in hazelnuts increases ten-fold when roasted, and the smell that wafts through the house as they toast in the oven is simply sublime. However once steeped in the milky mixture, and squeezed of all their goodness, the hazelnuts become surplus to requirement and the recipe suggests you discard them before continuing. On this occasion, I did, but it got me wondering what other recipes I could find to showcase the sweet, buttery flavour of a freshly roasted hazelnut. The perfect teatime treat . . . The answer is these cupcakes. Beautifully light and airy, with a rich, hazelnutty hit, they’re an explosion of flavour in a wonderfully elegant package. Hazelnut contains hints of cocoa which makes it the perfect match for chocolate (those people at Ferrero do know their stuff) so I’ve topped them off with a smooth dark chocolate buttercream. If I’m being a complete perfectionist, this topping is perhaps a touch too sweet; next time I’d like to try a simpler glossy ganache made with 70% dark chocolate and a little double cream. 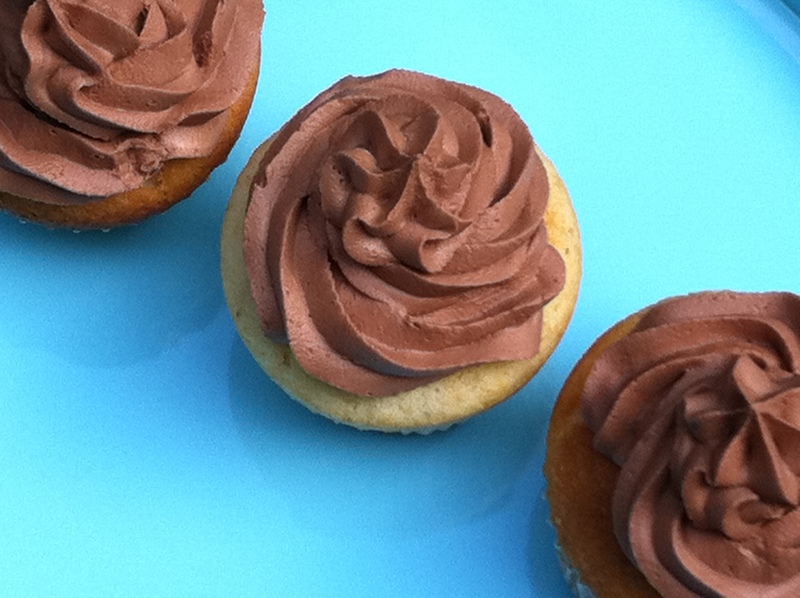 These cupcakes would also be lovely with a square or two of dark chocolate baked into the centre, or if you want to go all-out on the hazelnut front, a slick of fudgey Nutella frosting. The perfect pick-me-up and a wonderful showcase for my favourite new ingredient. Preheat the oven to 150 degrees C/Gas Mark 2. Place the hazelnuts on a baking sheet and roast for 15 mins. Remove from the oven and, once cooled, rub the hazelnuts in a tea towel to get rid of as much of the skin as possible. Blitz them in a food processor with 75g of the sugar until finely chopped. Increase the oven temperature to 170 degrees C/Gas Mark 3. Line two muffin trays with 12 paper cases. Sift together the flour, baking powder and salt. Cream together the butter, remaining 75g sugar, hazelnut oil and finely chopped hazelnuts til light and airy. Mix in the beaten eggs, a little at a time, then fold in half the flour and half the soured cream with a large metal spoon. Fold in the remaining flour and soured cream til smooth then spoon the mixture into your prepared cases. Bake for 20-25 mins or until lightly golden and a skewer inserted in the middle comes out clean. Remove from the oven and cool completely. In the meantime, blitz the icing sugar in a blender for a couple of minutes. Add the butter and vanilla and blend til smooth, then mix in the dark chocolate. Spoon into a piping bag and decorate the cupcakes. Lick the bowl. Done. Wow, they look seriously amazing. I found an ancient piping machine recently so hopefully my cakes can look this good soon too! These look utterly delicious! Must be extremely gratifying too… stumbled upon your blog and its lovely. 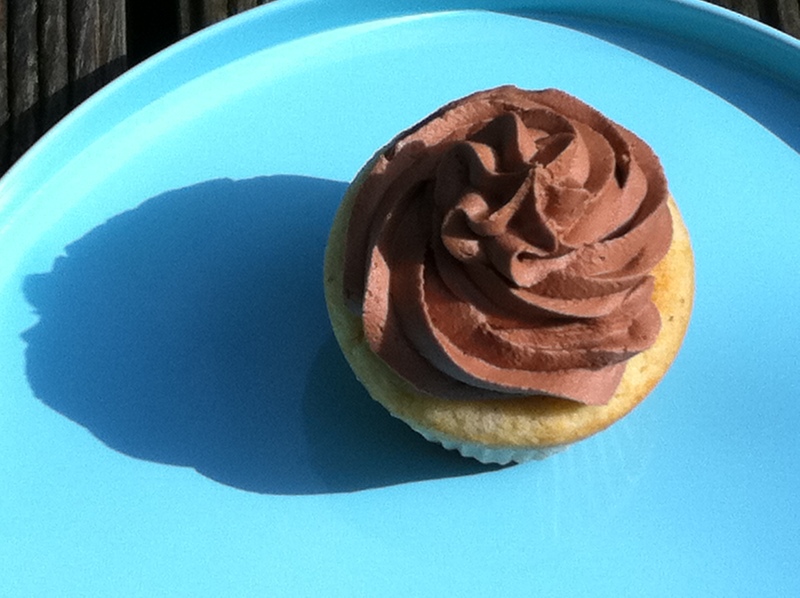 Frugal feeding – once you have a good piping nozzle it’s so easy to make cake looks professional! Karen – thanks for your comment. Just had a look at your site – that chocolate cake recipe looks wonderful. Thanks Sasha. Have been wondering if I could make my own Ferrero Rochers…have you ever tried? I love chocolate and for something to be dessert, it usually has to include chocolate. Another passion is Nutella. This sounds like it is right up my alley. Don’t even start me on the idea of baking some chocolate into the center or the Nutella frosting. I am all for you trying the Ferrero Rocher recipe, hehe! Oh, have mercy. Can’t decide if I want to start eating the frosting first, or just shoving the entire cupcake in my mouth at once! Thank you for your kind comment on my blog. Now I am pleased to have discovered your blog! What wonderful food you present! 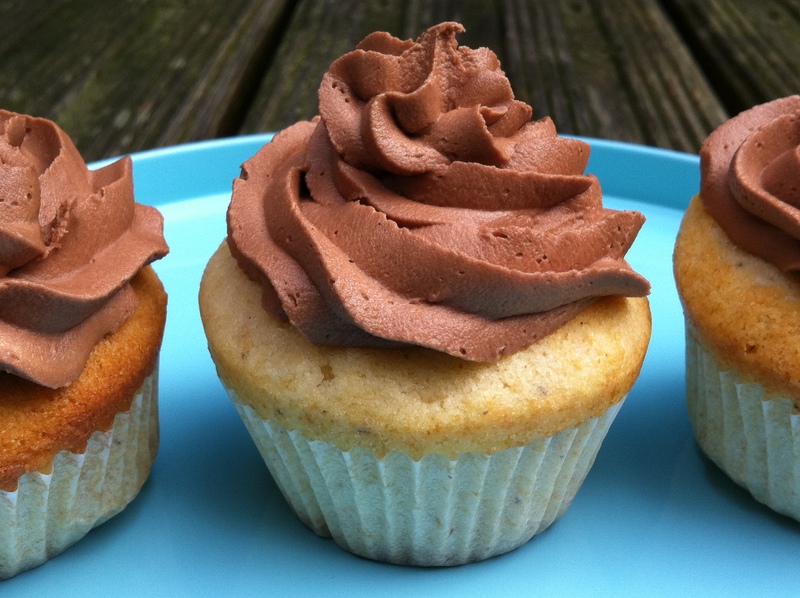 I love Nutella and this combination in a cupcake would be delicious! I will be making them soon! The cupcakes look perfect! Love both the dark chocolate icing and the hazlenut sponge underneath!! Thanks Anne – it’s a lovely combination and not too heavy, perfect for an afternoon pick-me-up! 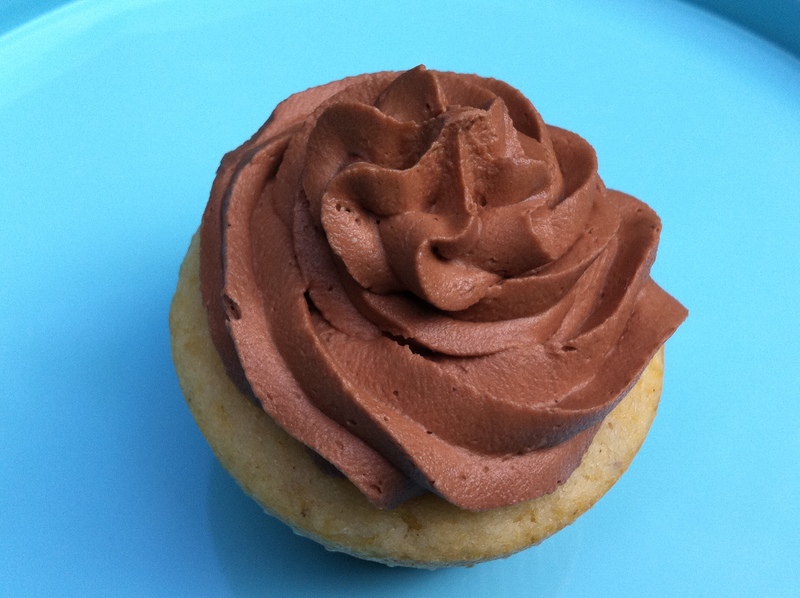 Love hazelnut… cool to put it in the cupcake… what a treat!